Beautifully set on the unspoilt hills surounding Cortona, among chestnut trees and beautiful valleys, the stone-built Villa Margherita Due is the perfect property for an unforgettable holiday in Tuscany. The villa offers welcoming indoor areas, furnished with taste and style, together with an incredibly large private garden with swimming pool and panoramic views. The villa is set on one floor (with additional mezzanine level) and comprises 2 double bedrooms (one with en-suite shower room), a twin bedroom (on the mezzanine level) with additional single bed (suitable for a child), open plan kitchen/dining area with sofa, satellite tv and wi-fi internet, and a large family shower room. Just outside the villa a shaded dining area with barbeque are available for al-fresco dining. Highlight of the villa will be without any doubts the huge, private swimming pool set within private gardens planted with local trees, flowers and equipped with a playground for children and table tennis facilities: a true heaven for the lovers of outdoor living! 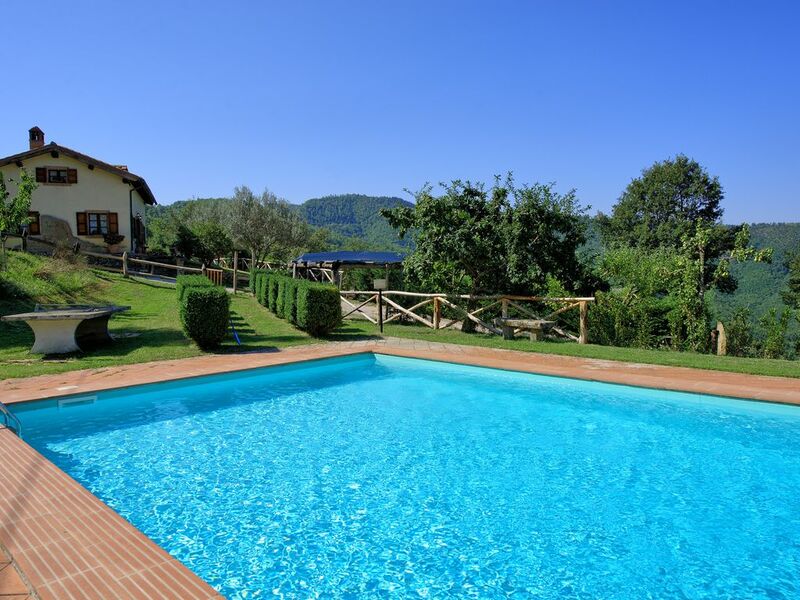 The pool measures 14m x 7m and enjoys beautiful views under the glorious Tuscan sunshine. Wether you want to spend lazy days by the private pool or you want to venture out on the many paths for a pleasant walk, Villa Margherita Due will be the perfect choice offering all the comforts for a unique holiday at an unbeatable price. Panoramic location and exclusive use of the property. Très bon accueil, un cadre idyllique pour se ressourcer au calme au grand air de la Toscane. We found this villa absolutely charming, the house is full of sweet details and homey Tuscan touches. We woke up to beautiful views from our bedroom. The property was well taken care of inside and out. We enjoyed exploring Cortona and the surrounding area but also spent a few days just relaxing by the pool and taking in the beauty of the countryside. We had a lovely vacation and we highly recommend this property. A great country home in Tuscany, we were very happy with this property. The kids ran around the large garden and we spent most of our vacation by the pool. The views from the pool are majestic, this is the place to be for a relaxing and peaceful vacation with your family. We really enjoyed this fabulous holiday villa. The large pool was fantastic, the owners were warm and the views breathtaking. We recommend anyone considering a trip up a Tuscany mountain! We fell in love with Cortona when we visited for just a day 10 years ago and couldn’t wait to come back and stay for a whole week. Villa Margherita was the perfect base for us to visit Cortona and the area. We liked the unusual layout of the house, and of course the grounds are beautiful, with very nice views. We recommend the Osteria il Teatro in Cortona, a special little place in the center. The hills surrounding Cortona are a true heaven of peace, with green trees, glorious sunny days and refreshing breezes during the summer evenings. Our villa is located within easy reach of the town center (which is a few minutes drive away), with its fantastic restaurants and traditional shops, as well as the Trasimeno Lake for sunbathing and swimming opportunities. Therefore this is the perfect location for a truly Tuscan holiday close to the most famous art cities (Siena, Florence, Cortona, Arezzo, but also Rome and Perugia) as well as to the beautiful and uspoilt forests of Central Italy.